Whether you are planning to go hunting, do your errands, fix your car, or repair something, having a multi-tool by your side is essential. Multi-tools are designed to make your everyday living easier. You will not limit the uses of multi-tools in hunting as it can do a variety of works. Now, if you are looking for the best multi-tool online, you can quickly get overwhelmed by the number of choices you will find. Hence, we will serve as your guide in choosing the right multi-tool for you. We’ve searched the market and had come up with a list of the top 9 best multi-tools available in the market today, the features that make the model outstanding, its pros and cons, and why you should buy it. 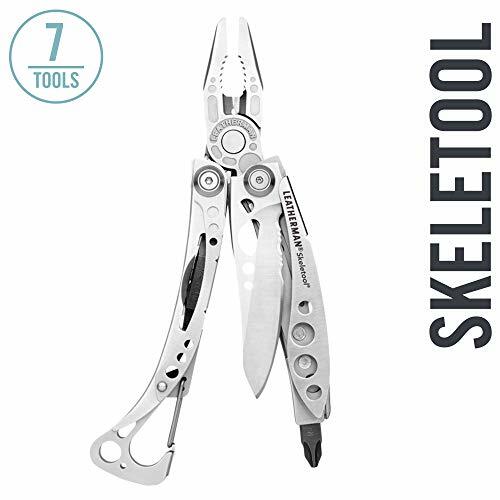 The Skeletool Leatherman multi-tool offers all the components that you are going to need in just a versatile and lightweight package. The most necessary implements are all present in this tool, and it only weighs five oz., making it ideal for every day carries in the forest or any outdoor activities that you might use the product. Its closed length is only four inches and its made of a 420HC stainless steel blade. It features needlenose and regular pliers, wire and hard-wire cutters, bit driver with big storage in handle, Philips #1 and #2, Screwdriver 3/16 inches and ¼-inch. It also has a Carabiner and bottle opener and a detachable pocket clip that lets you carry the tool anywhere you want. If you are keen on the durability of the product, perhaps you should check the Leatherman’s Surge. 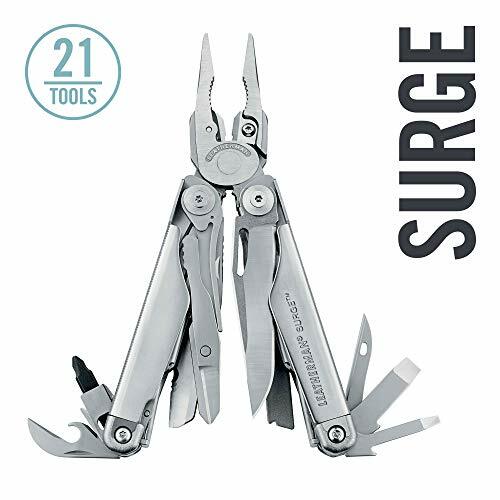 It is a multi-tool powerhouse-integrated with bigger and powerful pliers, long blades, and locks that are easy to use. This multi-tool is designed with the convenience of the user in mind with its unique blade exchanger that allows you to choose between a diamond file blade and a saw. It also has four outside-opening blades that allow you to access the tools that you need without difficulty. All these features are sold at a reasonable price! 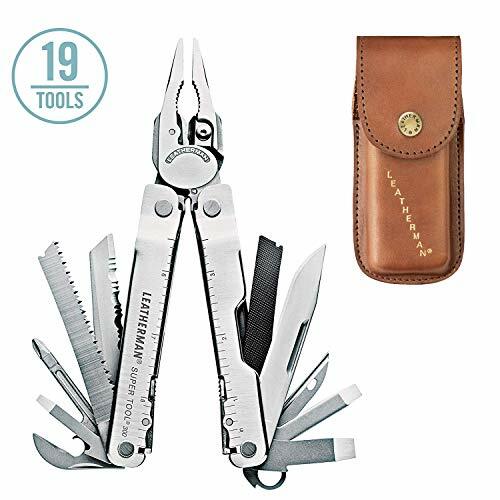 And don’t forget that the Leatherman prides themselves to be the manufacturer of the best and durable scissors you can find online as well as its clip-point knife. The multi-tool is made of premium stainless steel that makes your next hunting trip a lot easier. 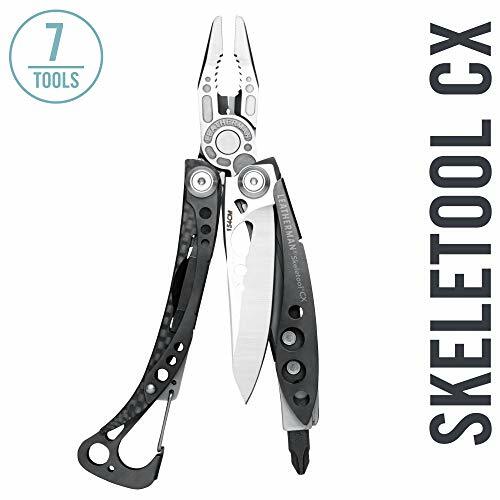 For those who are on a budget, we recommend the full-sized Skeletool CX Multi-Tool from Leatherman, only weighing at the mere five oz., this multi-tool is ideal in carrying it with you around in the forest. The blade is made of mighty 154CM stainless steel blade that can withstand heavy-duty use. It had been coated with tungsten DLC coating that can resist scratches in the long run. It also features a carbon fiber handle insert that provides optimal comfort when you are using the product. Included in the package is the Phillips #1 and #2, Screwdriver 3/15 inches and ¼ inches. Its closed length is only 4 inches. We also have the lightweight, pocket-sized, stainless steel tool from the Leatherman. This Wingman Multi-Tool features a blade that you can access outside and can be opened using a single hand only. Its newly-designed spring-action jaw makes it easier for you to operate the tool at all times. This device features spring-action needlenose pliers, spring-action regular pliers, wire cutters, 420HC combo knife, wood/metal file, a package opener, ruler, a small and medium screwdriver, Phillips screwdriver, a bottle and can opener, a wire stripper, and a pair of scissors. It also has a detachable pocket clip that allows you to carry the product anywhere you want. Buyers can enjoy the Leatherman’s 25-year warranty upon purchasing the product. 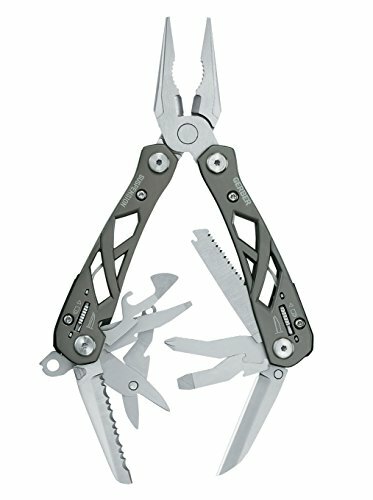 For outdoorsmen who want a budget-friendly multi-tool, you might want to check out the Gerber Suspension Multi-Tool. It features an open-frame design on a butterfly-opening handle, making it easier to operate. This multi-tool can offer spring-loaded needlenose pliers, sharp edge knife, serrated edge knife, and Saf. T. Plus component locking system. You don’t have to burn a hole in your pocket to enjoy quality multi-tool that you can use almost anywhere. The package also includes a durable ballistic nylon sheath that you can use to protect the tool when not in use. Its overall length is only six inches, making it suitable for everyday carry. 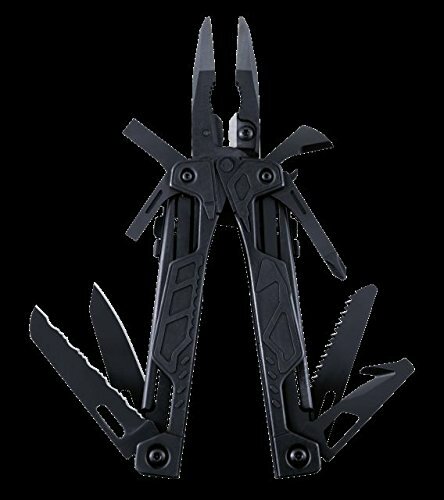 You might want to take a look at the original heavy-duty multi-tool of the Leatherman, the Super Tool. It’s back, and it’s even better than before! This multi-tool is a combination of 19 high-performance tools in one rugged unit for your everyday use. Engineers built this tool specifically for outdoorsmen who spend most of their days at the forest. The body is made of stainless steel, ensuring you a secure grip even if you have your gloves on. Also, this tool is essential in maneuvering the tightest spots or dealing with large cutouts with its many components. Its Super Tool 300’s larger pliers are one of the most robust pliers the Leatherman had produced. You can replace its 154CM stainless steel wire cutter when it’s worn out. For your safety, all interior tools lock out for safe use, and you can fold it back for secure storage. 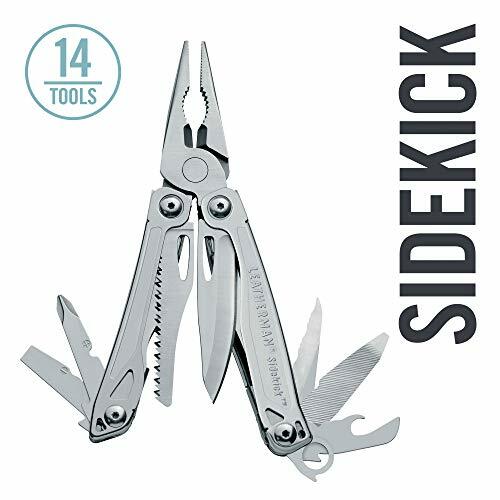 We also have this handy pocket-sized Leatherman Sidekick Multi-Tool that provides all the components you are going to need to get an outdoor project done in no time. It offers spring-action needlenose pliers, spring-action regular pliers, 420HC combo knife, wire cutters, 420HC serrated knife, wood saw, wood/metal file, a ruler, small and medium screwdrivers, Phillips screwdriver, a bottle and can opener, a wire stripper, and even a Carabiner bottle opener. Best of all, you can enjoy the tools we’ve mentioned above for a reasonable price! The package comes with a removable pocket clip and fixed lanyard ring, making it easier for you to carry the tool wherever you go. It only weighs seven pounds. This tool is ideal for everyday carry. Buyers can enjoy up to 25-year Leatherman’s warranty upon purchasing the product. 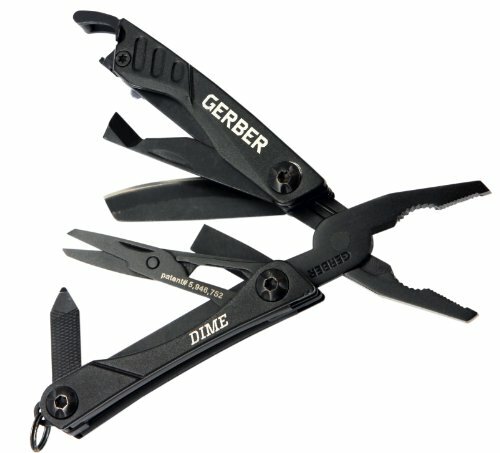 This sleek-looking multi-tool from Gerber, the Dime Multi-Tool is a standard keychain multi-tool but in a better and highly-functional package. This multi-tool offers stainless steel pliers, wire cutters, a fine edge blade, a pair of scissors, flathead screwdriver, crosshead screwdriver, tweezers, and a file. It also has a unique blade that’s engineered to cut safely and score plastic packaging. You can use the bottle opener even if the unit is closed. This multi-tool is lightweight and compact, making it a great tool when you’re always outdoors. Its closed length is only 2.75 inches; you can stash it in your boots or slip it inside your back pocket for every day carry. 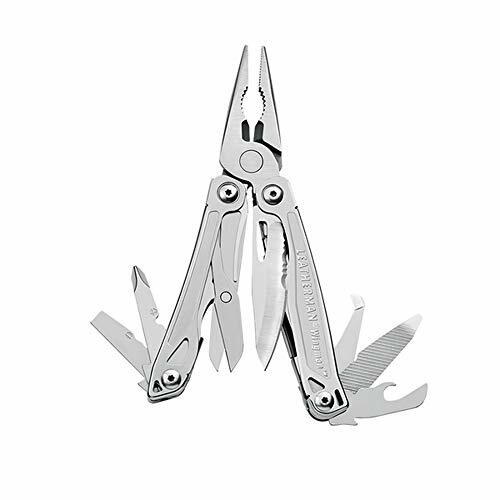 For the last product, we’re going to feature one of the best-selling multi-tools from Leatherman. This workhorse Leatherman multi-tool allows you to enjoy a one-handed operation. It is the combination of opening pliers and one-handed opening blades and tools in one versatile package. The OHT offers a 100% handed-operable tools that you can bring anywhere you want. You can choose between regular or hard-wire cutters, depending on the project that you are working with thanks to its detachable 154CM stainless steel wire cutter design. This multi-tool features the most robust tools in just one package that you can fold back when not in use. Buyers can enjoy up to 15-year limited warranty upon purchasing the product.